On April 22, our dear friend Hazel Dickens passed away. Hazel was one of the most important bluegrass singers of the last fifty years and the writer of very poignant songs drawn from her personal experience. Her ties to the Smithsonian Folklife Festival and the Festival family were long-standing and very close. Beginning in 1969, she appeared at the Festival fifteen times, and when Ralph Rinzler, the founding director of the Festival, would have office parties at his home, Hazel was usually invited. These were great evenings of sharing songs, and everything would always stop when it was Hazel’s turn to sing. The eighth of eleven children, Hazel was born June 1, 1935, in Montcalm, West Virginia, a town at the far southern end of the state in coal country. Her father, H. N. Dickens, was a truck driver, Primitive Baptist preacher, and part-time musician (Mike Seeger recorded him for Folkways). Her oldest brother died of the dread black lung disease from his years of working in the mines, and the family had to depend on public assistance—welfare—to pay for his burial. After World War II many residents of Appalachia moved north to the cities of Washington and Baltimore to escape poverty and find work. Others moved northeast of Baltimore to work in the country. Hazel and some of her siblings were part of this migration, relocating to Baltimore in the early 1950s when she was sixteen. She worked in the factories there. The Appalachian transplants kept together as a community, and she played music with her family. To get a taste of the old country music and bluegrass they had heard back home, they also could also visit the New River Ranch and Sunset Park country music parks. In 1954, musicologist and musician Mike Seeger was working at a tuberculosis ward in Baltimore where he met Hazel’s brother. Seeger, a member of the famous folk-singing Seegers, was also on the lookout for new tunes and songs and began to visit the Dickenses. At first they didn’t know what to think of this “city guy” and wondered what his motives were. Hazel thought he might “want to make fun of us or laugh at us or something.” He eventually won them over, and they formed a small performing group. Mike would also take them up Route 1 to the New River Ranch to see some of their favorite performers like the Stanley Brothers, Bill Monroe, and the Stonemans. Hazel fell in with other musicians in Baltimore. She began to play bluegrass in a group with Bobby Baker (featured on the Folkways album Mountain Music Bluegrass Style). She also got to know a group of musicians through jamming sessions which included Seeger and a young couple, Jeremy and Alice Foster. At one of the parties someone suggested that Hazel and Alice sing together, and they turned out to be a perfect fit. Hazel credits Seeger for helping her and pushing her into becoming a professional musician. “I was painfully shy and if Mike hadn’t gone out of his way to help and support me, I don’t know where I would have ended up” (from an interview with Kate Rinzler). Hazel and Alice began to become well known in the folk song revival circuit, playing such venues as the Newport Folk Festival. 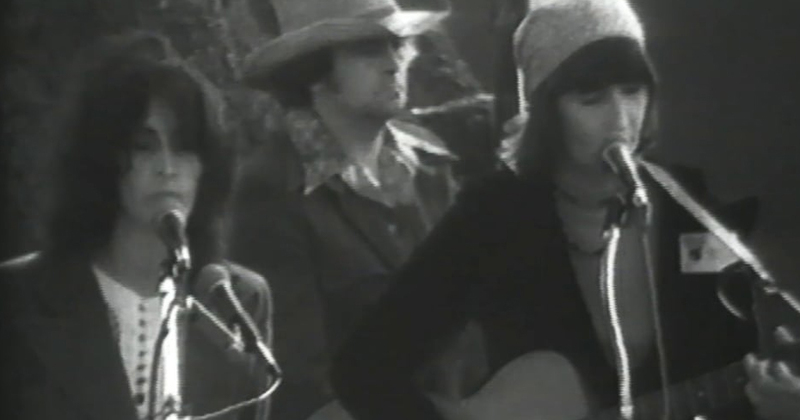 More importantly, Hazel and Alice were the first women to front a bluegrass band. It was their group, and they hired the musicians and picked the songs. (Hazel recalled from the days when she played with an otherwise male group that she never even received her share of pay for their gigs.) Hazel and Alice recorded two albums for Folkways and two for Rounder Records. The Folkways albums by Hazel and Alice apparently became popular in Japan, and Hazel told a story of being at the Station Inn in Nashville and being asked to sit in the band on stage. As she began to sing, a roar erupted from the table at the front, somewhat shocking Hazel. It was an entire table of Japanese tourists who had come to see her; they knew all the words to her songs. Starting in 1966, Anne Romaine and her Southern Folk Cultural Revival Project organized a tour of musicians through the southern states. On this tour Hazel was surrounded by Romaine, Bernice Johnson Reagon, and other politically active singers. She realized it was permissible to express her feelings in her songs, and she began to comment on the horrors she had witnessed firsthand in coal country. Her earliest coal-related song was “Black Lung,” based on the death of her brother. She wrote “Mannington Mine” after reading about a group of miners who had been killed and the mine sealed up, with them buried inside. Another strong theme in her lyrics was feminism. In her song “Don’t Put Her Down, You Helped Put Her There” she decries the treatment of women she saw while working in Baltimore bars. Hazel and Alice performed together during the 1960s and 1970s before splitting up professionally. Hazel went on to release solo albums for Rounder. Her music was featured in the film Harlan County U.S.A., and she also appeared and performed in the films Matewan and Songcatcher. Whenever Hazel performed, she would sing at maximum power. At our Festival, sound men would smile in anticipation and say, “Looks like I’ll have to bring some of my limiters today.” Her voice was something to behold. Hazel was elected to the West Virginia Hall of Fame. She was also awarded an honorary doctorate by Shephard College in 1998, a degree of which she was quite proud. When she was asked to perform as part of a series of concerts during the 2003 Festival, she was on the same bill as Dr. Ralph Stanley, and she let it be known that she should be referred to as Dr. Hazel Dickens. Hazel was also given the prestigious National Heritage Fellowship in 2001. Hazel lived most of her life in a small Washington, D.C., apartment not far from American University, but there was always a lot of West Virginia in her heart. Her song “West Virginia My Home” reflects her feelings about her native state and has been talked about as becoming a state theme song. Well, Hazel has gone back home to West Virginia now. We are going to miss her very much. Born in West Virginia, Hazel Dickens recorded twice for Folkways Records and was a frequent participant of the Smithsonian Folklife Festival, appearing some fifteen times. In this rare video from 1978, she sings one of her most treasured songs. Her friend, the late Phyllis Boyens, adds harmony.